Summerfest on low attendance: "It's not my fault!" Caleb Westphal hasn’t missed a Friday fish fry since 2013. Follow along with his record-in-the-making here. Being that I hadn’t been to Clifford’s Supper Club (10418 W. Forest Home Ave., 414-425-6226) for a Friday night fish fry since February 12, 2016, I figured it was time to return, and I made it this past week’s destination. As I arrived at the supper club, which has been open since the late 1950s, the parking lot was overflowing, but I somehow found a spot. The building is split into two sections. On one side there is a dining room, and on the other there is a large hall, or “family room.” Both sides have a bar. When you are on one side of the building it isn’t obvious that the other side even exists. I still remember sitting at the bar of the dining side the first time I visited Clifford’s. I called my friend to tell him that I was sitting at the bar. He said he was sitting at the bar too. I looked around but he was nowhere to be found. It turned out he was sitting on the hall side. To preclude this from happening again, this time I carpooled. In order to get more of a supper club vibe, my friend and I entered through, and went to, the dining room side. From the moment you open the front door, the character and soul of a building that thousands have passed through over the decades is revealed by decorative glass and a solid wood framework. We were seated right away, and in taking a look around, a fusion of kitschy and seemingly contrasting objects permeated my vision. Flower wreaths, strings of holiday lights, and red, white, and blue banners hung on the wall. A small disco ball dangled from the coffered ceiling. Folded red napkins stood up from white tableclothed tables. But none of it was tacky; it reinforced the Wisconsin bar and supper club originality of the place. I felt as if maybe I had stopped for a respite off a dusty northwoods Wisconsin road, but I hadn’t, I was just a pole cast away from Milwaukee. I ordered the all-you-can-eat fish fry, which is Icelandic cod. It pained me greatly, but I eschewed my staple Old Fashioned for a whiskey sour, as it was National Whiskey Sour Day. As the waitress walked away, my friend asked with a perplexed tone, “Aren’t you going to have clam chowder?” Now, one must ask oneself if adding chowder onto an all-you-can-eat meal is necessary, and in my experience, it has always been necessary. Always. I impatiently waited for the waitress to return, and gleefully ordered some clam chowder. We were brought some bread and rolls, along with the chowder. It was some of thickest chowder I’ve ever had, almost adhering to the spoon. This made it no less delicious though, and right as I was finishing it, the fish arrived. The fish fry at Clifford’s is served family style, so we were brought a big platter with fish, french fries, and lemons on it, and a bowl containing coleslaw and tartar sauce. The fish was top notch for an all-you-can-eat cod. The batter was light, consistent, and not greasy, and the flavor was memorable. The homemade tartar sauce complemented the fish nicely, and being that you are given two tartar sauces from the start, you know Clifford’s thinks ahead. The french fries were hot and crispy, and the coleslaw was a good creamy variety. It must be noted that being that it was family style, more fish, fries, coleslaw, and bread could be requested at any time during the meal. The waitress asked us if we wanted more, and suggested that we make sure we were capable of eating whatever we requested. 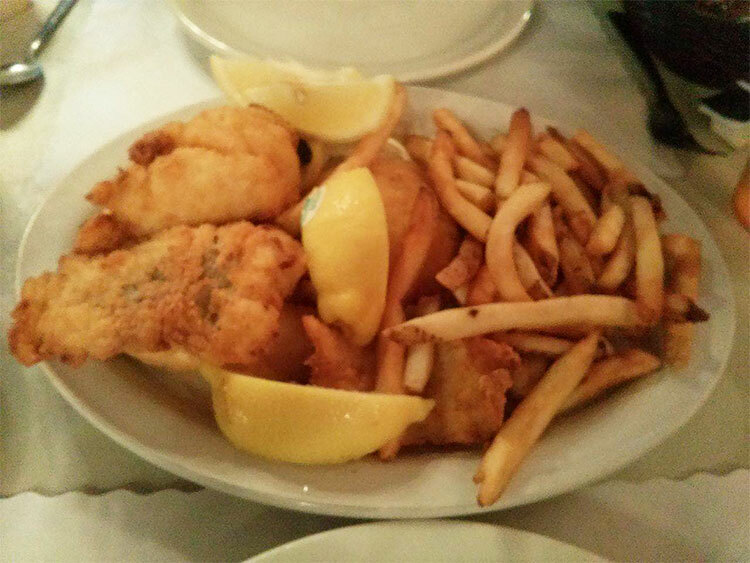 We went with a second platter of fish and fries, which was just the right amount. As I sat satisfied, I glanced over to the table across from us that had just been vacated. I noticed three pieces of fish sitting on a deserted platter, and pointed it out to my friend. “Those fish died for nothing!” he exclaimed. He suggested that I eat them so their lives would have had some sort of meaning, but in order to keep some level of decorum, I demurred. This won’t be the last time I eat Clifford’s fish. Some places have fish frys on Wednesdays and Fridays, and some places only expand to this during Lent. Clifford’s serves fish frys seven days a week. 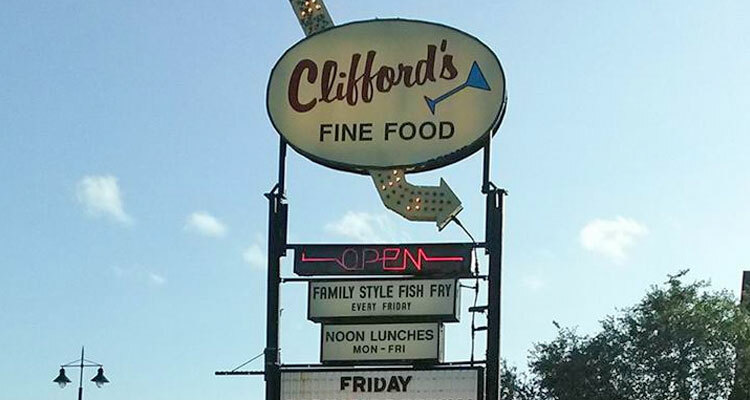 No matter where you are or when it is, you can always have a smile on your face, knowing that someone might be eating fish at Clifford’s right now. What a wonderful world. Rating: Building has two parts, so it’s like two fish fry restaurants in one; charming and nostalgic supper club vibes; great service; consistently delicious stream of all-you-can-eat-fish with a well-paired tartar; you can go here every day of the week for fish and you probably won’t get sick of it. I’m really torn here, should I give it higher than a 4? Sure. It has the perfect blend of ambiance and food. This one is pure Wisconsin. 4.5 out of 5 stars.